Professional makeup artists, actors, designers and photographers rely on Ben Nye’s incomparable quality and product selection. The Master Production Kit is ideal for film, video and theatrical productions and includes an outstanding makeup collection for a variety of character designs and cast members. Five Matte Foundations complement complexions ranging from fair to brown tones. Practical Creme Highlights, Shadows and Concealers are included to correct and augment facial contours. Finishing products, such as Eye Shadows, Pencils, Powder Rouge, Bruise Wheel, Blood and makeup tools complete the ensemble. 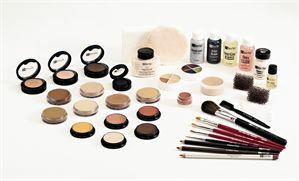 Components: Five Matte Foundations, Creme Rouge, two Creme Highlights, Creme Shadow, Cover-All Wheel, Bruise Wheel, Powder Rouge, two Pressed Eye Shadows, Cake Eye Liner, three Eyebrow Pencils, Lip Pencil, Lip Color, Hair Color, Fair Translucent Powder, Quick Cleanse, Spirit Gum, Spirit Gum Remover, Stage Blood, Rouge Brush, Velour Powder Puff, Sponge Applicator, Stipple Sponge, Flat Brushes No. 2, 5 and 7, Round Brush No. 1, Eyebrow/Lash Comb, Swab Applicators.